LIWANG, June 19: Thawang, the bastion of the decade-long Maoist insurgency, is finally gearing up for the elections after boycotting several polls in the past. The election constituency is witnessing stiff competitions among parties formed after splitting from the former rebel Maoist party. Other parliamentary parties such as Nepali Congress and CPN-UML which were seen as rivals of the then rebel party are also competing in the historic local elections after a gap of 20 years. 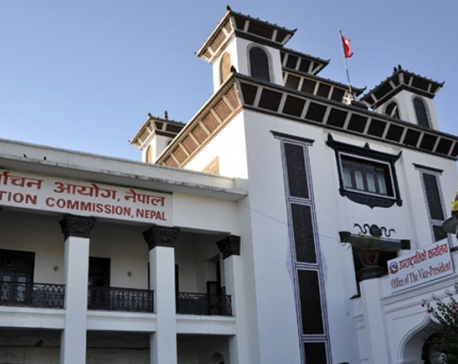 As the Election Commission (EC) has mandated June 18 as the date for filing nominations, various parties have enthusiastically filed the nominations of candidates. CPN (Maoist center) has fielded Bir Bahadur Gharti, the party in-charge of the district, for the post of Thawang Rural Municipality chief while Ram Kirani Roka has been fielded for the post of vice chairperson. The party has fielded candidates in all five wards of the rural municipality. “We are trying our best to woo as much voters as possible,” said Gharti. Similarly, Netra Bikram Chand-led CPN (Maoist), which has been opposing the elections, has also seen its party members register their candidacy. Amit Pun and Bhakta Gharti of the party have filed for independent candidacy since the party had earlier refused to take part in the local elections. Likewise, Nepali Congress (NC) has also fielded Amit Gharti, a local, as an independent candidate for the post of chairperson of the rural municipality. Shree Kumari Roka has been chosen to compete for the post of vice chairperson. As informed by the district chairperson of NC, Amit has a good hold in the locality. Meanwhile, CPN-UML has fielded Heet Bahadur Roka as the chairperson of the rural municipality and it has forwarded the name of Jana Roka for the post of vice chairperson. Bhakta Gharti, a local, has also filed for independent candidacy for the post of rural municipality chief. As Thawang had strictly announced not to take part in any elections, no political parties dared to step into the village for poll campaigns during the last Constituent Assembly (CA) elections. This had maintained a great uncertainty among the locals as well as other political parties regarding the upcoming local elections. However, the active participation of locals and political parties has raised a lot of eyebrows. For the first time, locals of Thawang have shown so much of excitement for the elections. The desire of having a better village and facilities has compelled the locals to take part in the elections. “Hope of better future has elated the locals and I don't think there is any possibility of elections being deferred or foiled,” said Bir Bahdur Gharti. There are altogether 5,800 voters in Thawang. KATMANDU, Feb 2: The Election Commisison (EC) has completed printing the ballot papers for upper house elections slated for next week.